This print appears to have been inspired by Ron Mueck's 1997 work "Mask." From Supply and Demand, pg. 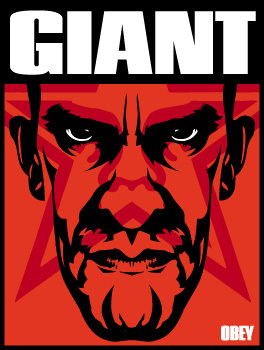 248: This image is an illustration I drew of a guy with somewhat of a creepy face, which I called “Giant Brother” as a reference to George Orwell’s 1984, where the government has everyone under surveillance and their slogan is “Big Brother is watching you.” I illustrated half the face and then mirrored it, and I discovered that since no face is perfectly symmetrical, the symmetry introduces an inhuman, sinister aspect to a picture that might not be as disturbing otherwise. I thought the guy looked creepy to begin with, but it turned out even scarier than I had predicted.